Although base metal alloys were used in the 1970s, gold (Au) was traditionally used for dental restoration because it is unusually malleable and ductile making it easy to work with. Gold is a “noble” metal which is ideal for dental applications because with the exception of silver (Ag), which tarnishes, noble metals resist tarnish and corrosion, and are non-toxic and hypoallergenic because they take part in few chemical reactions. These qualities made gold a great fit for use in dental work—but to be truly useful, it must be alloyed with another metal, because it is actually much too soft to be used in it’s pure form. The quickest, non-destructive way to identify a dental alloy for making certain it is the proper grade of material prior to insertion as well as identifying the value after use during refining is with the Bruker S1 TITAN. The Bruker S1 TITAN can identify the composition of a dental alloy in less than 5 seconds. Click here to submit a message to find out more about the Bruker S1 Titan! While jewelry is typically hallmarked and made from fairly standardized alloys, the same is not true for dental alloys. There are approximately 1000 different dental alloys and they are not marked in any way to identify the precious metal content or composition. Some of the metals used in these alloys, like platinum (Pt) and palladium (Pd), are noble metals. However, there are also metals like copper (Cu), iron (Fe), tin (Sn) and zinc (Zn), which are transition metals. Each of these metals contributes distinct qualities to individual dental fittings, which must withstand various stresses depending on their function. Some of today’s dental customers specifically request (and pay for) alloys containing gold and other noble metals such as palladium, platinum, and silver but many modern dental fittings contain no noble metals at all. In other cases, only a trace amount of gold is added to an alloy to satisfy insurance regulations—not for its metallurgic qualities. In essence, paying more money for a dental alloy that contains precious metals may not necessarily mean you are getting what you pay for. Since there is no way to identify the material while it is still being used in your mouth, customers must wait until the dental fitting is removed or ready to be replaced before determining the exact composition. The touchstone method of analyzing gold has been used for thousands of years, and is still in use today. It is a decent way to determine the gold content of valuable pieces because it’s mostly non-destructive and takes relatively little time and equipment. Simply rub the gold item on an abrasive, finely-grained stone, such as black siliceous slate or red radiolarian chert, and treat the resulting streak with acid. The color is then compared to a similar streak made by a needle of known purity and the same color. While it is accurate to 10 or 20 parts per 1000, it requires a skilled practitioner to achieve that accuracy. And if, as many dental fittings are, the gold is white due to being alloyed with white metals such as nickel (Ni), platinum (Pt), palladium (Pd) and silver (Ag), “touching” is impractical. The colors of white golds between 333 and 916 parts gold per 1000 are too similar to produce accurate results. For reasonably accurate results, articles to be tested for the presence of platinum (Pt) must contain at least 900 parts per 1000 of platinum. There is no touchstone test at all for any of the other platinum-group metals, including palladium (Pd). Since dental alloys use such a variety of metal alloys, the touchstone method is impossible for use with anything other than yellow gold alloys and even with yellow gold alloys, the limitations are not worth the results. State of the art dental alloy analysis includes instruments such as the Bruker S1 TITAN which can swiftly and accurately provide composition results for every element found in dental alloys except beryllium. X-ray fluorescence is completely non-destructive to the item, eliminating the dangers of acid, and the time and expense of assaying a sample by harsher methods. 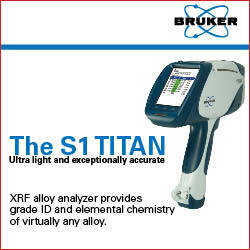 XRF instruments like the handheld Bruker S1 TITAN, emit x-rays directly into the sample. Because the energy of the x-rays being emitted into the sample is greater than the binding energy of the electrons in the sample, the electrons are ejected from the inner orbital shells of the atoms. Every element has electrons fixed at specific energies in a unique spacing, giving it a specific “signature.” Atoms become unstable when they lose electrons, so they pull higher-level electrons down closer to the nucleus to replace the electrons displaced by the x-rays. The further away an electron is from the atom’s nucleus, the higher the binding energy. This, too, is unique to each element, because the spacing of these electron orbits is also unique to each element. Thus the energy lost as an electron moves between shells is also unique to each element, maintaining the unique signature of the element through the x-ray period. Properly calibrated to detect precious metals, the Bruker S1 TITAN can calculate what elements (gold, silver, copper, zinc, platinum, palladium, mercury, and nickel, to name only a few) are present in the dental fitting and in what concentrations. 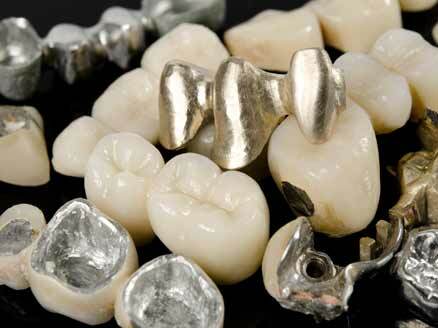 Dental fittings that contain noble metals typically contain a high percentage of those metals. Formally, dental alloys that contain over 60% noble metals are classified as “high noble.” Noble alloys contain at least 25% of noble metals, and non-noble metal alloys contain less than 25%. The Bruker S1 TITAN can determine dental alloy value very rapidly: usually within seconds. Virtually anyone can learn how to properly use the Bruker S1 TITAN within a very short training period. That operator can then generate high-quality reports that can confirm the exact composition of the dental alloy. This report can reassure a client as to the trustworthiness of a source—and perhaps the duplicity of a competitor.No longer must they choose between the expense of assaying for platinum group metals, in a group of fittings that may or may not contain them, and the risk of not assaying for them and possibly discarding them. Instead, fittings containing platinum can be reserved until it makes financial sense to assay the entire group for platinum, improving the bottom line of both client and refiner. Silver, which is part of amalgam fillings, has a significantly lower price per ounce than other noble metals. XRF analysis with the Bruker S1 TITAN also allows the client to store these fittings separately so they can be refined in a cost-effective manner. At 1.5 kilograms, the Bruker S1 TITAN is one of the lightest tube-based handheld XRF analyzers available, it is fully portable. It offers exceptionally fast and accurate analysis, thanks to Bruker’s silicon drift detector technology. The Bruker S1 TITAN also includes Bruker’s patent-pending SharpBeam™ technology, to provide you with exceptional performance. Call today to discuss dental alloy analysis needs!